Read an eBook Day is a celebration of modern storytelling. Be a part of the festivities by checking out your favorite eBook from your library and join the conversation below by sharing what you’re reading and stories about why you love eBooks. 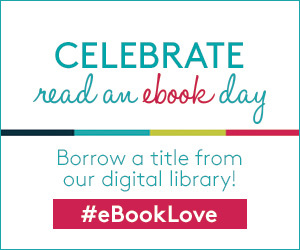 Be a part of the festivities by checking out your favorite eBook from your library and join the conversation below by sharing what you’re reading and stories about why you love eBooks and by using the hashtag #eBookLove on social media.